We are located downtown Traverse City on Front Street between Cass Street and Union Street on the north side of the road. Go West on Front Street just past Cass look for us on the right side. 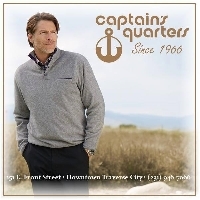 The Captain's Quarters is a fine men's store located downtown Traverse City, Michigan. We feature the best in quality tailored clothing and furnishings. 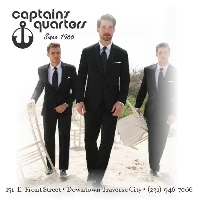 You will find a large selection of Suits, Blazers, Tuxedos, Vests, Dress Shirts, Ties and Dress Socks. 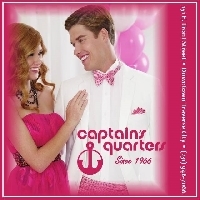 We also offer beautifully made custom Suits, Tuxedos, Sport Coats, Vests, Pants, Shirts and Ties. With a huge selection of Spring and Summer / Fall and Winter Sport Shirts, Dress Pants, Casual Pants, Sweaters, Sport Coats and Socks you will be very pleased you stopped in. Weddings? Yes! We have over 80 tuxedos styles for you to choose and with literally hundreds of vest, tie and cummerbund colors and styles we can help you create your very elegant formal wedding, a casual affair and everything in between. You may want to rent your formal wear, or you may want to purchase your formal wear. With the Captain's Quarters it is your choice. Prom? We have been serving our local schools since 1966. Need a deposit to order? No, you pay for the tuxedo when you pick it up. Expensive. No, don't let those big coupons and national advertisements fool you, our prices are lower. We make it fun and affordable for students and their parents. Stop in as see why. Fine Mens Clothing and Furnishings. Weddings: Formal wear to rent or purchase. Prom: Serving our schools since 1966. Coming to a Northern Michigan this summer - The boys are taking care of business....Pull up a chair and we'll show you how they do it. Scott Barber designs and select fabrics that will flatter you and meet your high standards for look, feel and performance. Come in soon and see the great selection waiting just for you! At Prom Time, and there's only one place to go to make sure everything goes smoothly. Let our formal wear professionals help you pick out a great looking tux, and measure you for that perfect fit. Been invited to the White House? Have an audition coming up for the next James Bond movie? Just want to look great? 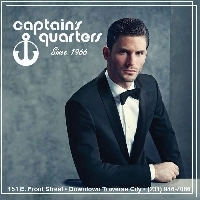 Stop in or call the Captain's Quarters today. We'll make it happen.